Home » Law Life » Gratitude – What Are You Grateful For? Summary: When I find myself unhappy and overwhelmed I know that thinking of everything I’m grateful for can make a huge difference. I’ve been having a rough few weeks, feeling overwhelmed and unhappy in a couple areas of my life. When I find myself in situations like these I know that thinking of everything I’m grateful for can make a huge difference. 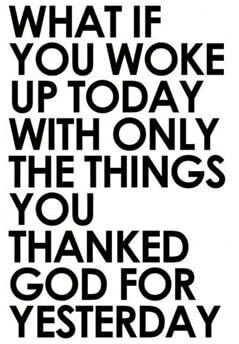 Granted, someone else usually has to remind me to be grateful! We all go through difficult things in life, but we have SO many blessings as well. When you focus on the good rather than the bad, it can completely change your mood and your outlook. Maybe you didn’t get that promotion you really wanted and deserved, but you probably have a job thousands of people wish they had, or a great family life, or wonderful friends, etc. So I challenge you today to sit down and write out 10 things you’re grateful for. Tomorrow do the same with 10 new things. See how long you can keep this going! Today I am grateful for: water to drink, my friend Alex, the fact that I have a job, my delicious lunch (spaghetti squash casserole), the opportunity of becoming a healthy living coach, a new friend at work, the beautiful weather today, my new small group, my studio apartment, and writing this blog!